BigLift’s number one priority is to see that all its personnel and vessels remain safe in every single voyage and that no harm is done to the crew, the vessel or its cargo. As a leading heavy lift shipping company, BigLift sets its targets high and aims for zero accidents. 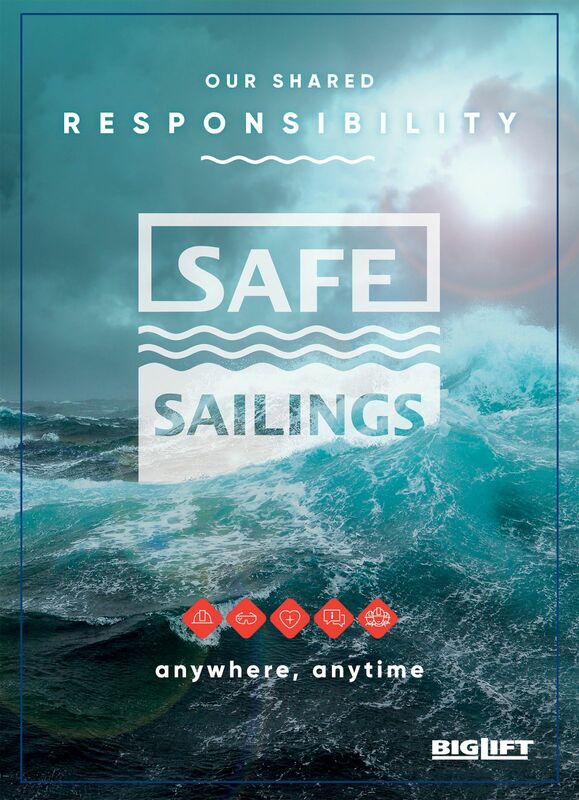 To that end, the safety awareness programme ‘Safe Sailings’ has been developed and was launched in September 2017. Spliethoff and BigLift together already have an extensive management system that outlines all the necessary procedures. On top of this, BigLift has kicked off the Safe Sailings programme to include all employees in the company-wide desire to work as safe as possible and make this part of everyone’s ‘DNA’, so that accidents are reduced as much as possible with the ultimate goal to reach the zero mark. Safe Sailings was designed after thorough research amongst all BigLift personnel, both on shore and on board of its vessels. All experiences and suggestions for improvement have been taken into account in the design of the programme. Apart from improving safety awareness and knowledge amongst all personnel, the programme will provide a platform to share and learn from feedback and improve information exchange. Twice a year, a new safety topic will be addressed. The first topic will be personal protection equipment. BigLift is convinced that Safe Sailings will improve BigLift’s overall performance further and enable all stakeholders to profit from the increased awareness.